Chefs au Sommet d’Auron hosted chef Basile Arnaud and pastry chef Bruno Laffargue for a dinner with terroir flavors at Les Pivottes restaurant at Hôtel L’Ecureuil. 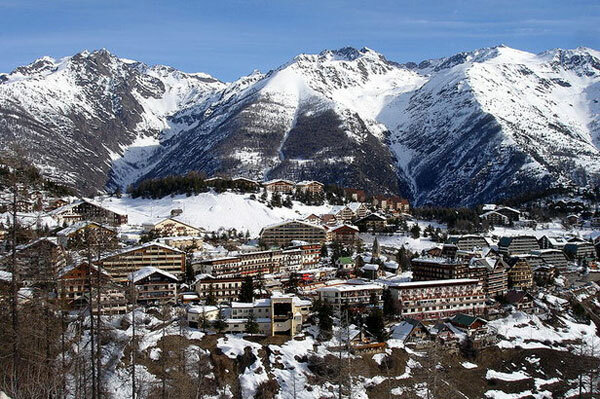 Chefs au Sommet d’Auron offered for their 6th edition, from 14 to 20 January 2017, memorable gastronomic experiences at a unique and privileged price. 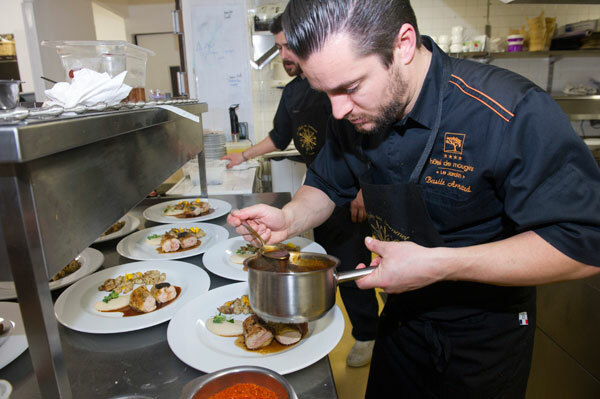 Every evening, renowned chefs have shared their talent in the restaurants of the resort by proposing sumptuous gourmet dinners at the price of 45 Euros per person to tourists and residents of the resort and Haute Tinée. 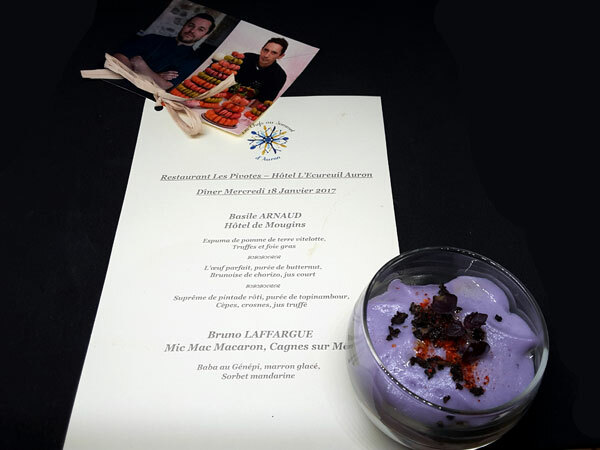 The young chef Basile Arnaud from L’Hotel de Mougins and the pastry chef Bruno Laffargue from Mic Mac Macaron have delighted the gastronomes at Les Pivottes, restaurant of the Hotel L’Ecureuil in the center of Auron. 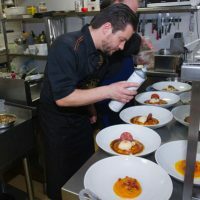 For six years now, the Festival de la Gastronomie de Montagne has attracted a number of talented chefs and pastry chefs from the Côte d’Azur who come together at the foot of the trails to provide moments of authentic culinary pleasures and conviviality in the heart of the sumptuous Mercantour mountains. 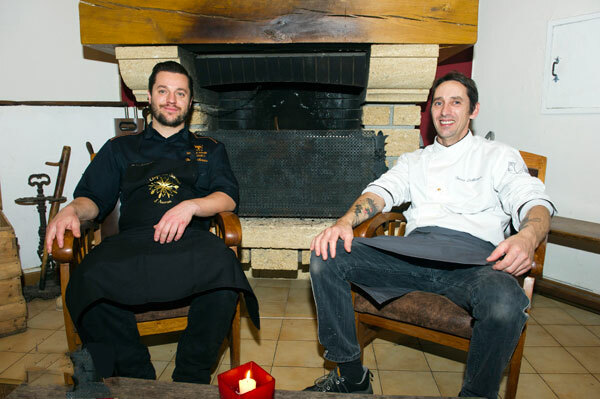 On Wednesday, January 18, 2017, Hotel L’Ecureuil in the heart of Auron welcomed in the kitchens of its restaurant Les Pivottes the young and promising chef Basile Arnaud, chef of the restaurant Le Jardin at L’Hotel de Mougins and the famous pastry chef Bruno Laffargue from Mic Mac Macarons in Cagnes Sur Mer. Together, they have delighted gourmets with their flavors of terroir, combining simplicity and modernity, in plates with colorful artistic compositions. To start, our eyes feast on this verrine of rare old French potato with violet flesh. On the palate, the light foam, spiced with a point of shallot, lets escape the enthralling perfume of thetruffle, which hovers on the dish and sublime the smooth pearls of foie gras. The flavors from the earth merge, awakening the senses and the taste buds! Superb with its warm colors and appetizing fragrances, the “perfect” egg – its texture is softer and more creamy than a hard-boiled egg but firmer than that of a soft-boiled egg – dialogue with the crispy and salty chorizo slice and its pieces, whose powerfull taste brings out the egg with its flowing yolk. 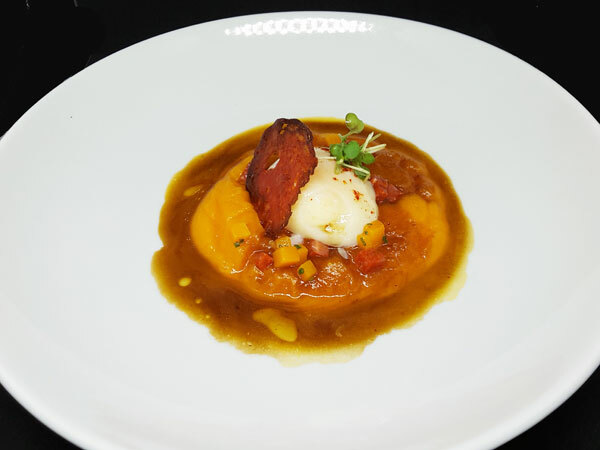 The spicy and salt of the chorizo also contrasts with the sweetness of the butternut to give the dish a rough earthy elegance. 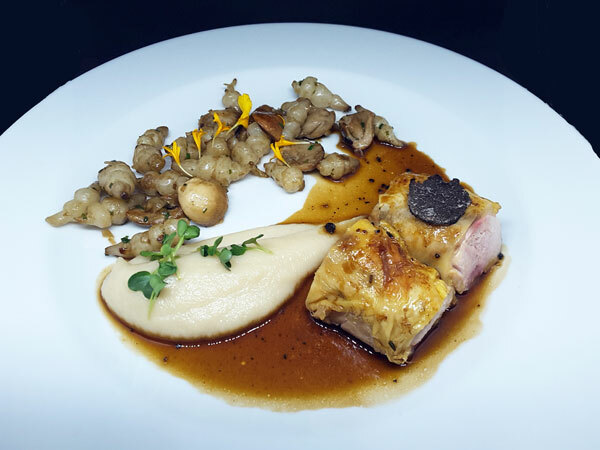 A diapason of flavors from soil and underwood, a clever blend of textures and tastes, between the sweetness of the topinambour – with the delicate flavor of artichoke – the crunch of the elegant crosnes – with the light taste of Hazelnut – and champigons – truffle and cepe – that harmonize the garnish of the guinea fowl with perfect cooking, whose rosy flesh became engorged with juices. Winter comes on the plate and open the door to cravings for authentic products, terroir products whose diversity and gustative strength reconnects with our deep roots. Pastry chef Bruno Laffargue followed this inspiration of the terroir by setting the course, with a tapering, golden and sweet sail, towards the rich flavors of mountain, enhanced by a jewel of its ancestral heritage, the genépi. Between the rocky peaks of marron glacé, and the golden snowflakes, the baba – Yéti in ambuscade – watches over the tempting tracks of chestnut cream. A delicate dessert, perfect to end a meal with well-defined flavors. 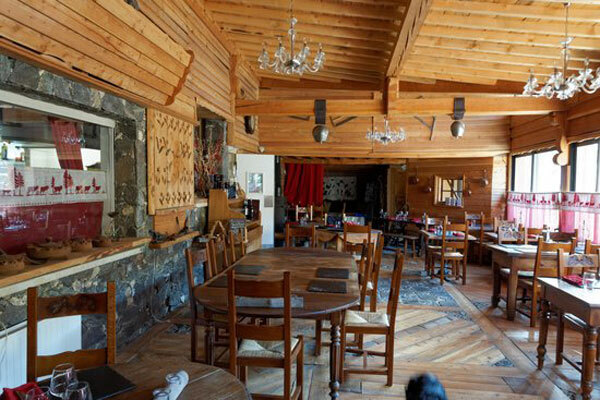 In the heart of the popular resort of Auron, adopted city of Princess Stéphanie de Monaco, the three-star Hotel L’Ecureuil cultivates a warm chalet atmosphere, offering a friendly and attentive welcome al year long to enjooy a green mountain in summer and white in winter. Every evening, the restaurant Les Pivotes comes alive around its wood-burning stove – for winter evenings – and offers its semi-gastronomic, seasonal, à l’ardoise cuisine, offering the classics of mountain specialties but also revisited dishes from our childhood. The 34-year-old chef was born in Cannes. He earned his BEP Cap Cuisine at the famous Paul Augier Hotel School in Nice, with a complementary mention of caterer. 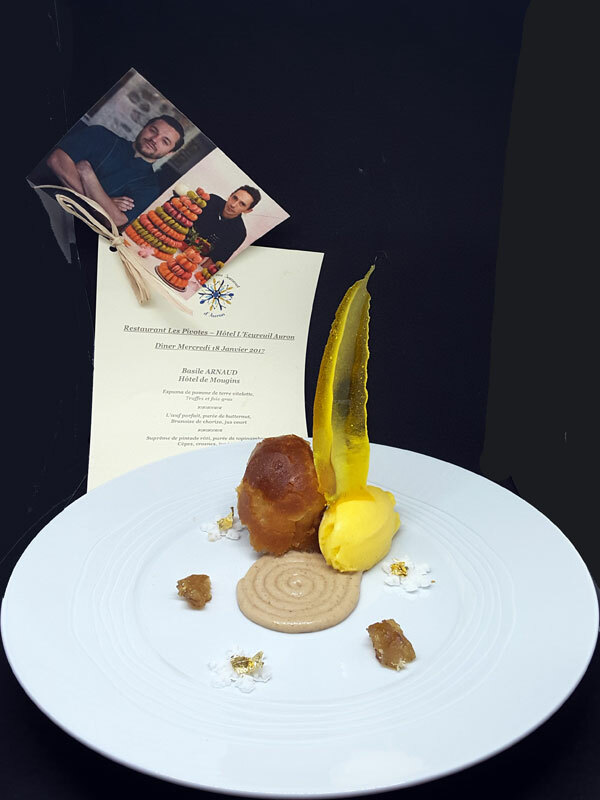 From 2002, he traveled to fine-tune his talent, first to London where he worked alongside Keith Podmore at the highly acclaimed gentlemen’s club Boodles Club and then to the United States, with Pierre Chambrin, Maître Cuisinier de France. 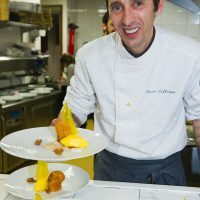 In 2008, he discovers in Australia the Asian influences and flavors before joining Serge Gouloumes and David Chauvac at Le Mas Candille in Mougins as 2nd deputy chef. 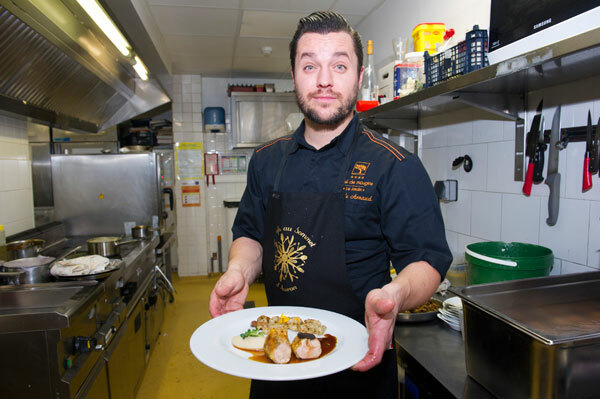 In 2014, he was Arnaud Tabarec‘s 1st deputy chef at the Sea Sens in Cannes. Passioned with pastry from a young age, Bruno Laffargue began his apprenticeship in pastry on the Côte d’Azur in Vence. He perfected his talents during travels in Haute-Savoie, then in Paris and London. He then worked in luxury hotels in Ireland, Dubai, Qatar, Australia. 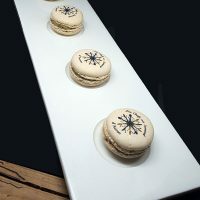 In 2009, he and his wife created his company Mic Mac Macaron, manufacturing macaroons in Cagnes sur Mer, and soon met with great success, producing up to 7,000 macaroons per day. A success that earned him the second prize in the “Stars and Métiers” contest in April 2011 for his know-how. 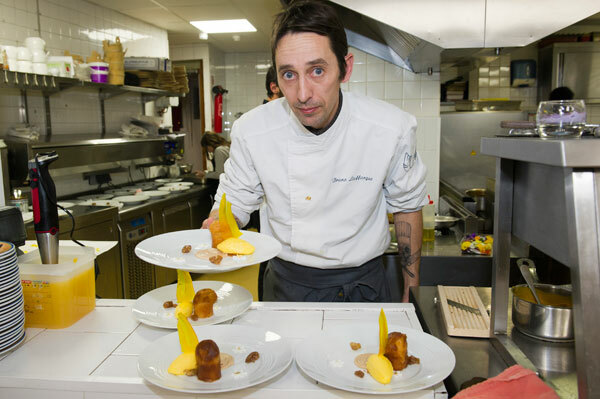 During Chefs au Sommet d’Auron, Bruno Laffargue hosts many pastry workshops.